Now it goes without saying that I am a full-on Disney fan. I've been to Walt Disney World once or twice a year for years. I mean, come on, I write a Disney travel blog! To say the least, I was set up to be a bit biased to like Walt Disney World more than Universal Orlando. That said, I was pleasantly surprised by Universal. I had expected it to be similar to Six Flags, but it really was on par with Disney in many ways. In this post I'll break down some of the main discrepancies in the parks in a vs. battle! 1. Theme: Both Walt Disney World (WDW) and Universal Orlando's Islands of Adventure (IoA) have immersive theming meaning that in whatever area of the park you are in, you feel like you've walked into another world. In the Wizarding World of Harry Potter, I am a wizard on my way to Hogwarts. I could do magic! In the New Fantasyland, I am in the Beast's Castle and Belle's Cottage. I am there. The enchanted furniture talks, and the Beast could be around any corner. 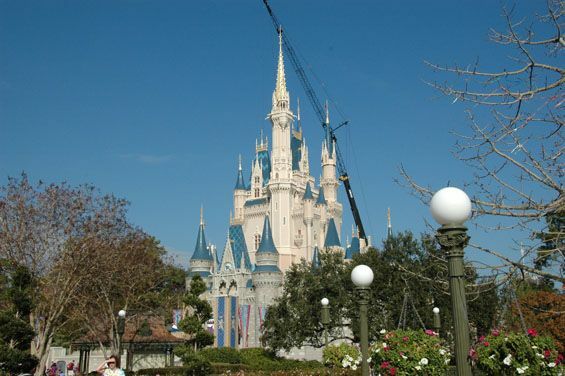 In this regard the point goes to both as both parks have mastered the art of transporting their guests to a new world. It's a tie. 2. Parking: When you drive yourself to Islands of Adventure, you park in a parking garage. Even paying extra for "preferred" parking has you walking a LONG way into the park. Sure, they have moving sidewalks, but depending on where you park, you could already be tired by the time you get to the gate. At Walt Disney World, you park and walk a few yards to the tram that takes you right to the gate of the park you are visiting. It's easy in and out with no searching for a space as WDW cast members guide you to a spot just for you. Hand's down, Disney wins in parking. 3. Ride Storage: When you ride a roller coaster at Walt Disney World, you either keep you bag around you and lower the restraint over it, or you place your items in a bag attached to your car. In the Islands of Adventure, rides like Harry Potter and the Forbidden Journey have free lockers to place your bags in. My camera bag easily fit in a locker, and it was secure until I went back for it. While the area of crowded and hard to get in and out of, it still gave me peace of mind that my DSLR wouldn't get banged up on the high action ride. In this case, Disney could learn a thing or two from Universal. Rockin' Roller Coaster and Space Mountain could use storage like this. 4. Photo Destroying Cranes: Ever line up the perfect shot of Cinderella Castle only to come home with something like this? That crane can ruin every shot if you go when Christmas decorations are being hung, and that sucker is up for a while! Not to be outdone, Islands of Adventure has its very own photo-ruining crane! 5. Thrill Rides: Each Disney Park has a 2-3 thrill rides, but only one roller coaster goes upside-down. Hands down Islands of Adventure has more thrill rides. If your family is one who loves roller coasters and seeks excitement, Islands of Adventure is worth a try. I think in this regard they're both just different types of parks. Disney does amazing stuff with all of it's attractions, but Islands of Adventure gets the point here simply on volume alone. 6. Attraction Seat Size: Disney has done well catering to "Pooh-Sized" guests for years now. I have never seen anyone be turned away from a ride due to size constraints other than being too short. At Islands of Adventure, seats learn toward the small size. I was slightly squished in the Forbidden Journey seat, and I didn't even want to try the seats on the Dueling Dragons ride. The worst part about this is that isn't not just about extra weight. Women with larger chests, men with broad or muscular shoulders, and those who are quite tall might have issues with restraints and be denied entry to an attraction as well. While retrofitting seats on older attractions could be costly there's absolutely NO excuse for seats on new attractions such as the Forbidden Journey to not safely fit people of all sizes. No argument: Disney wins big time here! 7. Downtown Shopping Area: Both WDW and Universal offer a shopping and dining district. The difference in the two is that Downtown Disney is in a separate location from the parks offering various forms of transportation to and from the area. Universal's CityWalk is a huge area after you have to walk completely through to enter or exit the park. While I love the atmosphere in both, I don't want to be forced to walk the length of either area before I even get to start my day and after I've had a long day in a park! This meant the morning we went to IoA, we had a forever long walk before we got to the Wizarding World of Harry Potter in the way back of the park, and on the way out, it felt like we'd never get to the van! Point going to Disney for knowing their dining and shopping district needed to be a separate area with enough amazingness to attract guests to visit it without forcing them to walk through it. 8. FastPasses and Universal Express/Unlimited Express: Both WDW and Universal offer front of the line passes to their guests. Disney uses FastPasses which are open to everyone in the parks no matter where they stay or what sort of ticket they have. These passes are time limited, so you can't do the entire park skipping queues. Universal uses Universal/Unlimited Express which costs money unless you stay on-site. You can read about it here. The price gets pretty steep for more than one person. Because it's free and open to everyone, even though it is limited, I say Disney wins this one too. Both have their drawbacks, but the price attached to Universal's pass is too expensive on top of their pricey park ticket. It's a close call, but in my book Walt Disney World is still better than Universal Orlando. I would still go back to Universal as the visit was quite entertaining. Both could learn something from the other to make guests more comfortable and have better experiences, and neither is perfect by any means. I simply believe Walt Disney World goes out of their way to be better than the competition. Case in point: a Universal custodial cast member was sweeping in Seuss Landing, and his supervisor told him to cover Seuss Landing and Lost Continent. When he asked if he needed to change uniforms to go from one land to the next, she told him no. Disney goes out of its way to make sure that cast members dressed for one land do not walk through a different land. The second one person decides it's ok to suspend the illusion for a moment, a bit of the magic is gone. What do you think? Have you been to both parks? What does your family prefer? Next post we head back to Walt Disney World to New Fantasyland in Magic Kingdom! Come back Friday! Very interesting post Joanna!! We haven't visited Universal yet, but hope to check it out on our next visit. interesting. I still have no desire to visit Universal. I went in 1998 and have not wanted to return. I'm not a Potter fan, so that is not enticing at all to me!! However, my 13 year old would love to visit Universal! Great post! I've never been to Universal. Many times the opportunity was there and we just passed on it for a day at Disney. Someday I'd like to see the WWHP. I like them both but WDW does heart and emotions better. Love the crane shots! We have yet to go to Universal, so this was great for learning how it compares to Disney. I am neither a Potter fan, nor a Simpson fan, but that didn't matter at all! the detail at these parks is simple awe-inspiring, and so much fun! I love Universal, and I love the "accidental" character meet and greets, like seeing the Mystery Machine parked on the street, and there's Shaggy and Scooby waiting for photos! Iconic actors like Lucille Ball and Marilyn Monroe wander Hollywood BLVD near Mel's diner with little to no wait line for photo ops. I also love the thrill rides at Universal, and the Single Rider line is a must for me. Wish Disney offered that. I had more fun at Universal than at WDW.